The Bullseye Locations event management module is a simple but powerful tool to promote location-oriented events to users on your website through your existing store or dealer locator software. Events can either be incorporated into search results via an upcoming event message or you can add an event search tab to your interface. Users can get more details by clicking through to the event landing page. Bullseye provides all the front-end and back-end tools for creating, managing and configuring the events and event display. Incorporate event details seamlessly into search results or display a separate event search tab. Ability to quickly add locations to events that are outside dealers or stores in your store locator search. Configure event start and end dates to automatically display ahead of the event and hide after the event. Dynamically configured event landing page is fully responsive and optimized for SEO, works as a stand-alone page or integrates with your website. WYSIWYG editor to customize colors, fonts, map icons, upload photos, add your own header and footer, and link to social media sites. Configure multiple events at once with our upload features supporting both import templates and field mapping. Out-of-the-box event landing page includes integrated map and directions and allows you to integrate with registration tools like Cvent and EventBrite. 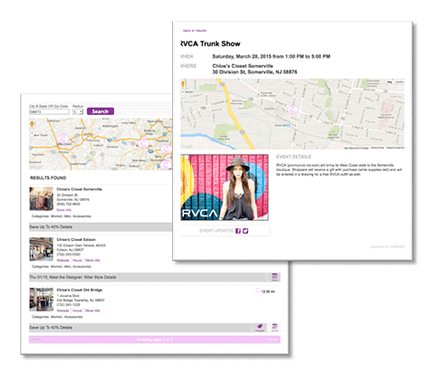 Provides easy-to-use tools for creating and managing events and event content. Allow users to search events within custom categories you create.